What can we say about the job Coach Johnnie Lawson has done a heck of a job overall 10 seasons as head coach, posting a total of 235 wins and 53 losses. There were lots of disappointments the first 8 seasons of having great regular season records but falling short when games mattered most, getting to state final fours regularly but falling short. The established leader of that defense has been UCF commit Diamond Battles who's game we've watched improve every year since she was a freshman, spearheads with that in your face defense that can be very intimidating, then the enforcer in the paint Rutgers commit Tyia Singleton, then you also have perimeter specialist Tampa U commit Malijah Sullivan, and Zakiyah Franklin, who is also a smooth operator on offense as well, and everyone else does what is the most important part of a team and that is playing there role. All these qualities and things I've just described have turned into a winning formula of three straight state championships, the notion that Lawson can't get it done has not only been dispelled, his team is nationally ranked and possibly has a shot at a national title with a 32-1 record, this season. 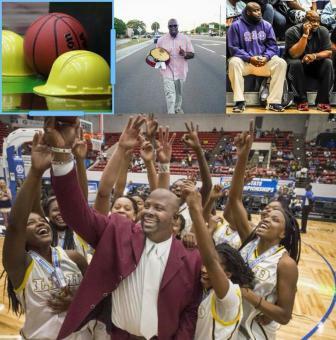 Coach Lawson has made his mark and has established his own legacy in this game which no one can dispute so continue to carry on teaching these young ladies the game and everything it is that you do sir! Again congrats to you and your ladies!! !